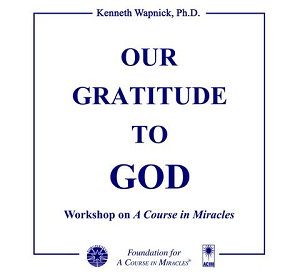 This series of excerpts is from our tape album, "Our Gratitude to God," a workshop presented by Kenneth in 1989 at our former location in New York. The theme of gratitude is discussed in the context of our gratitude to God, Jesus and the Holy Spirit, and to each other. The many forms of our resistance to being grateful are discussed in depth. They are seen as expressions of a fundamental ingratitude. This lack of gratitude ultimately stems from the original separation thought, where we resented God's having created us, and insisted instead that we created ourselves. Our expressions of gratitude, therefore, help us undo this original error.